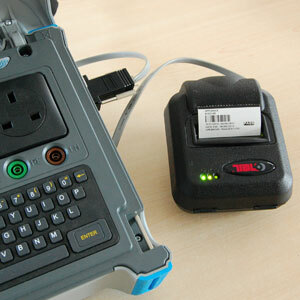 We occasionally receive requests to supply or recommend a pat tester that can print a label. Fluke, Megger, Metrel, and Seaward all have compatible label printers that can be used with their downloadable PAT testers. But there are few things you should consider first. PAT label printers are not cheap. Typically prices range anywhere from £300 - £600. Then you also need to consider the cost of the label stock and possibly ribbons / cartridges and batteries that may also be needed. For example, the labels for the Seaward Test n Tag printer are £38 RRP for 142 labels (or just 96 cable wrap type labels). That works out a nearly 27p per label. By comparison, a pre-printed PAT label will be more like 4p per label, and significantly cheaper if you buy large quantities. Some of the cheaper label printers are the direct thermal type. Although this is usually the cheapest option, the durability of the label is often poor. Similar to a car parking sticker left on your dashboard, thermal paper labels are affected by sunlight and heat and will often fade and become unreadable. A better option is the thermal transfer printers. Although the printers and labels are more expensive, the synthetic labels are far more durable and will not fade. Using a label printer is usually slower than using a well designed PAT label. Most experienced PAT technicians will apply a pre-dated label whilst the test instrument is still carrying out the tests. Using a printer requires the test to be completed and saved before it will start to print. Although this may only take another 30 seconds extra per appliance, if you have 120 items to test, it may take you an additional hour to complete. If you are testing in multiple locations, working your way through various rooms, desk to desk, the inconvenience of carrying the printer is also something to consider. Unfortunately there are no PAT instruments currently available with inbuilt printers. The wired types are usually cumbersome as the wires inevitably become tangled. The wireless bluetooth label printers are better and they are usually small enough be clipped to your belt, however you will probably find that it still gets in the way when trying to squeeze under a desk to plug and unplug appliances. In most cases, for electrical contractors carrying out the PAT testing in a competitive market, the additional costs involved makes label printing an unrealistic option. PAT label printers are more suitable for in-house PAT testing, especially where test instrument is kept in the same place and there are fewer items and time constraints.